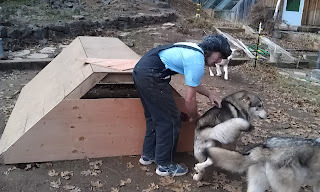 I designed this wolf den to meet the physical and psychological needs of your new wolf hybrid puppy from our wolf hybrid ranch. 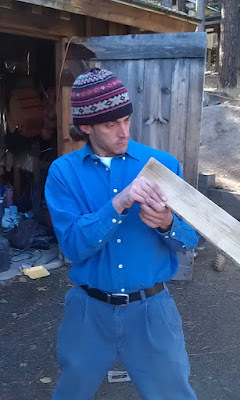 The design and list of supplies are simple. 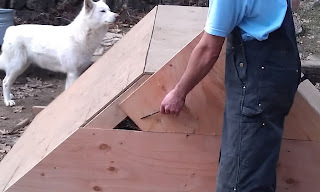 Hopefully, you will find my pictorial guide to building a wolf den helpful. 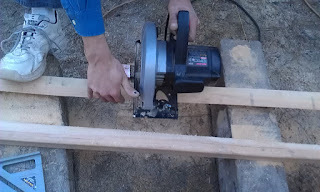 Make sure to set asside your straightest 2x4, because later you will be ripping at a 45 degree angle. 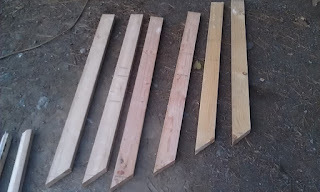 Also pick one that doesn't have many large knots. 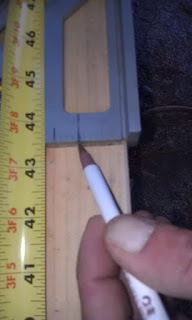 Set the depth on your saw blade so that your blade only cuts 1/16th of an inch past the bottom of the board. 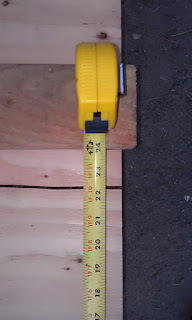 #3 CUT 3 OF THE 2X4s Measure the half way point of the 2X4s - you should draw a sraight line at 4 feet - the halfway point of the 8 foot long 2X4. 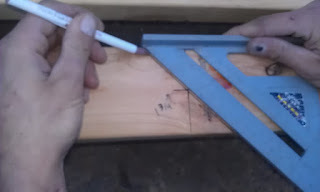 Using your 45 degree angle, place the center of the angle on the halfway line you just drew. 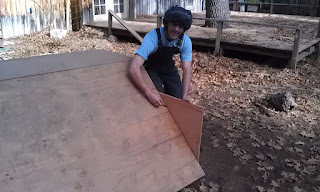 Make a line on the board along the angle. 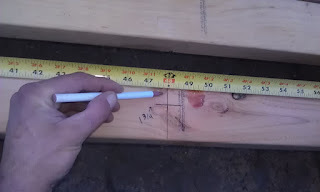 Cut the 2X4 along the 45 degree line you just drew. 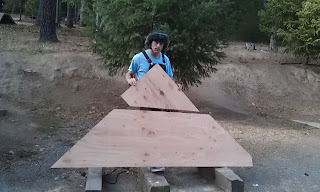 Repreat this for all three 2x4s. 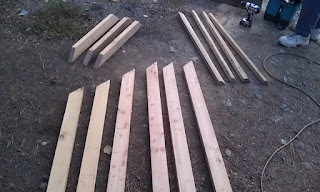 You will end up with Qty 6 legs, each with a 45 degree cut on one end and the flat factory cut on the other. 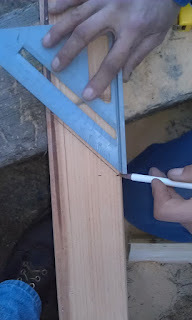 Draw a 45 degree angle line through the center of where your two lines cross. 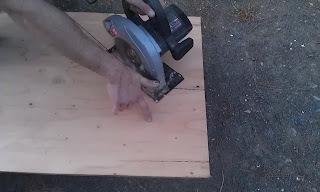 Do this same step on a total of three 2X4 boards. 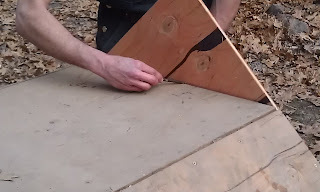 Cut along your 45 degree line through the center of the board. 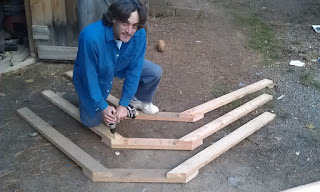 You will have six legs ready. 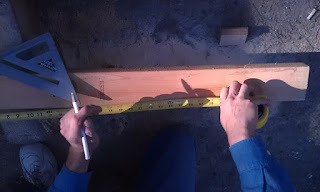 #4 CUT 1 OF THE 2X4s You will end up with Qty 3 pyramid shaped 2X4s with the top edge measuring 24"
measure 24 inches from the short point of the 45 degree line. 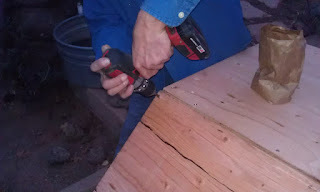 Continue down the 2x4 untill you have marked three equal blocks. 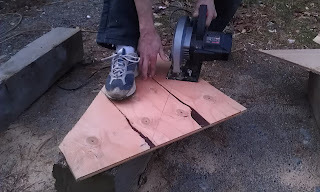 Cut into three equal sections. 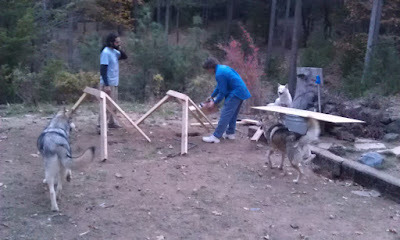 Now you have three ridge blocks that will become the roof of your den. 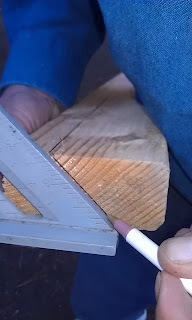 Look down the corner of your 2x4 to make sure it is good and straight. 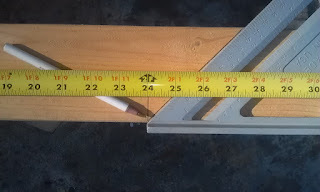 A straight 2x4 will be easer to rip at a 45 degree angle if it is straight and free of large knots. 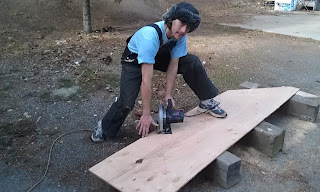 Mark long ways one inch (1") in from the edge of your board. 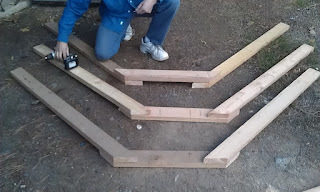 When you are done you will have two equal halfs that will have a 45 degree side and a 90 degree side. 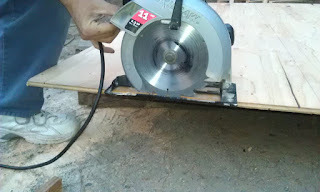 Change the table on your saw to the 45 degree position. 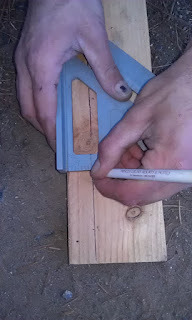 Set the depth on your saw so that it doesn't go through the board more than 1/16 of an inch. 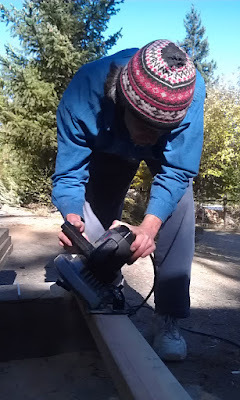 When ripping be careful if the saw kickes back. 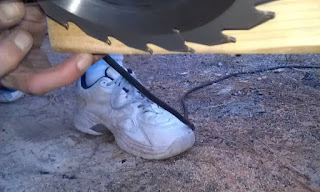 The saw has the potential to kick back two feet. 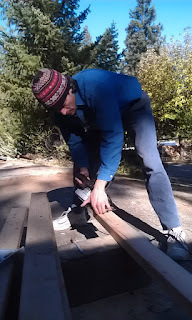 So keep a respectable distance from the rear of the saw. 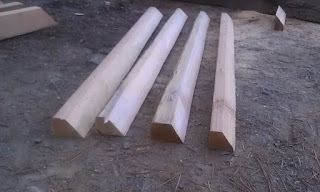 Then cut your ripped sections into 43 1/2 inch lengths. 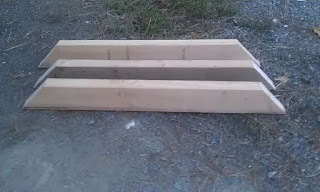 These pieces become your ridge block connectors. 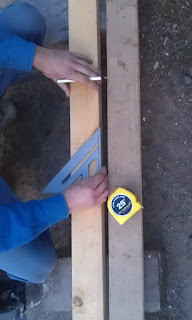 Line up the 45 degree edges along the top of the ridge block and the 45 degree edge along the leg. 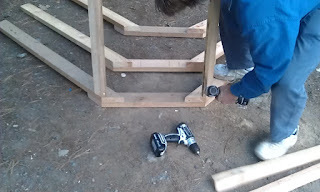 Use two three inch screws to attach the ridge block to the legs. 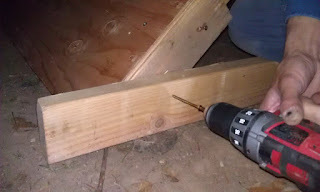 Pre-drill a two inch hole, 1/32" through the ridge connector board at a 45 degree angle and into your ridge and leg assembly. 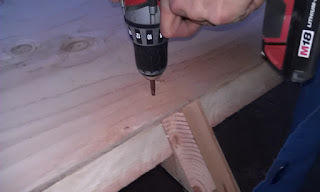 Insert a two inch screw holding your ridge connector to the leg. 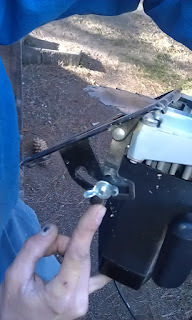 This is called a tow-nail. 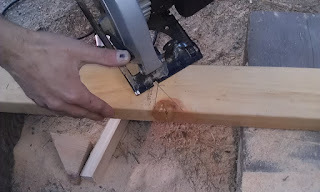 Tow-nail four of these ridge connectors to your leg assembly. 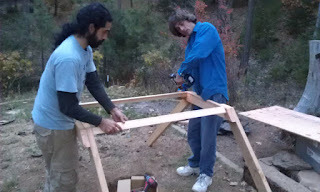 At this point you should probably recruit help - I brought in my brother Seth. 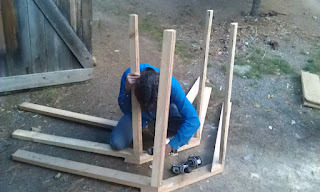 Carry the pre-assembled parts into place before you put these pieces together. 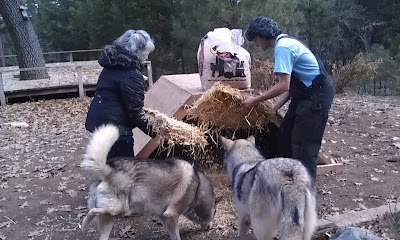 The wolves typically find this part of the process fascinating. 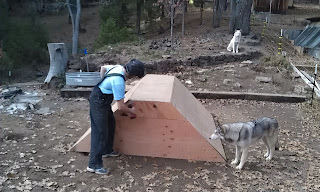 If you have a wolf dog audience, be sure to watch your tools and paper bags full of screws. 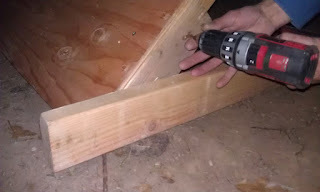 Tow-nail your rige connectors together from the other side. 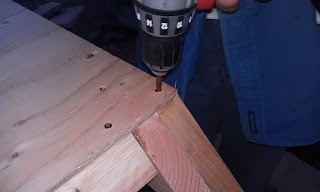 Use the same method of pre-drilling pilot holes and screwing the ridge connectors to the legs. 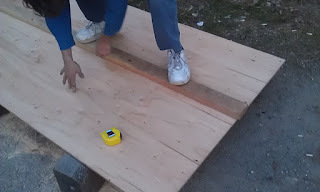 Take the two foot (2') piece of plywood and square it up to the corners of the leg and ridge piece as close as you can roughly. 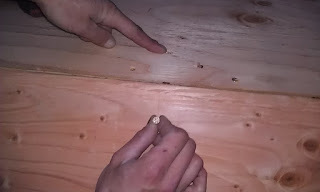 Use the edge of the plywood to square up your frame and set your first 1 1/4 inch screw into the corner of the plywood. 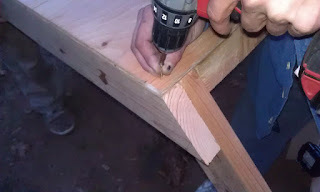 Place the screw so it goes into the outermost 2X4. 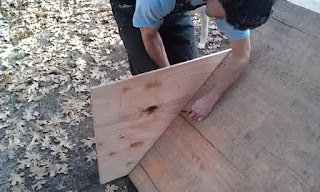 Continue around the plywood placing one screw in each of the corners. 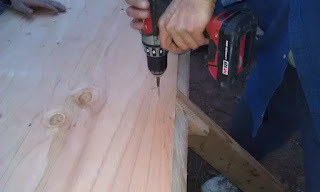 Straighten the frame each time as you put in each of the first four screws. 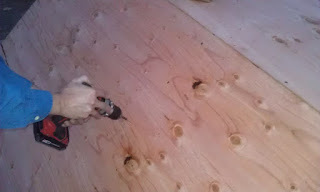 Place one screw in the ridge block inset two inches (2") from the edge of the plywood, when you screw on the other piece of plywood you will be able to locate the center of that board. 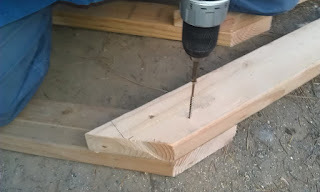 That will be usefull when you screw the next plywood to the frame. 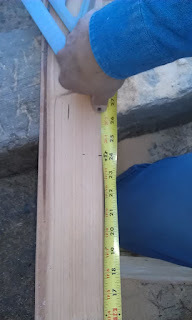 Place one screw at the end of each ridge block connector then continue until you have one scew about every six inches (6"). 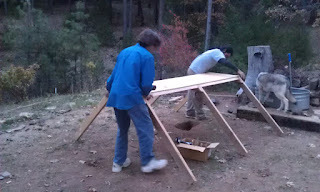 Use the same process as before to square up the corners of the plywood to the frame and the legs. 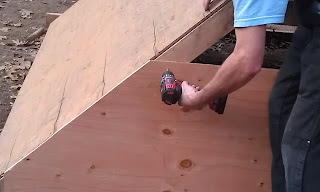 Use the inset screw on the top to locate the the center leg, so you can place your screw into the right spot on the side roof. 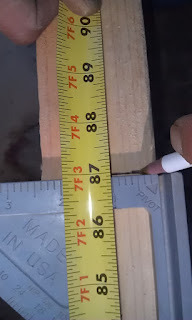 Put one screw every six to eight inches (6"- 8"). 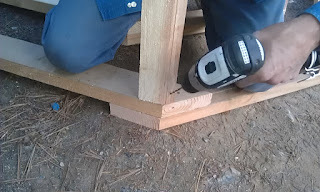 Use one of your left over 2X4 blocks to screw in to your leg at the end if you need it to brace your 2X4 bottom brace. 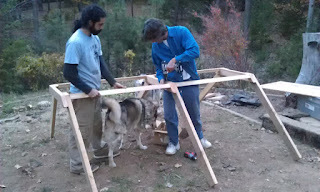 Screw in your last 2X4 as the bottom brace at one end of your wolf den. 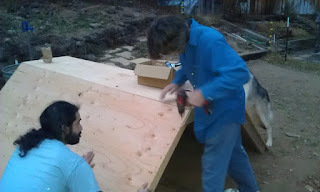 Cut the sheet of plywood along the cut-lines you drew at the edge of the roof. 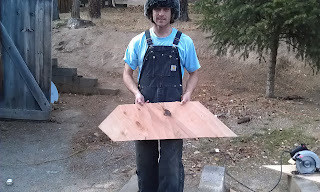 You should have two pieces of plywood looking like this. 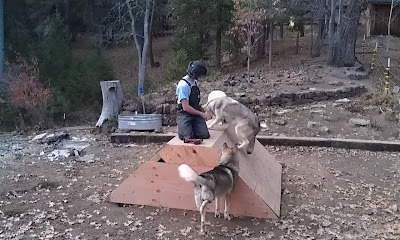 Take the smaller piece of plywood and put it on top of the piece you just screwed to the back of the den. 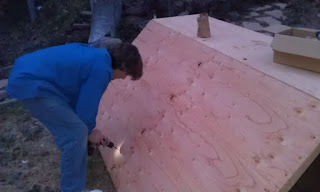 Draw a line along the top corner edge of the roof. 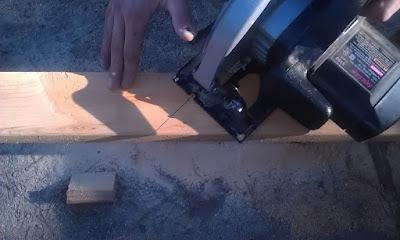 This will be your cut-line. 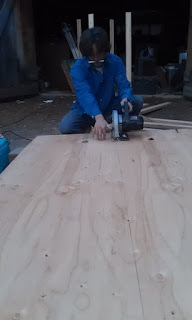 Remember that odd way we had you cut the plywood earlier? 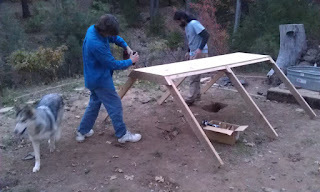 It was so you and the wolves could have a little peep hole in the back.